If you haven’t had a chance to visit the San Antonio Calligraphy Guild (SACG) Spring Exhibit in the Arbor Room at Los Patios, you’ll want to do so before the end of May. The exhibit includes the work of 22 SACG members. I was particularly impressed by the pieces of BJ Nichol (Holiday Traffic) and Leslie Winakur (Self Portrait as a Night Person). Those pieces alone are worth the trip. San Antonio has a young growing guild of glass artist and enthusiasts who come together from a variety of disciplines including warm, cold and hot glass. We meet monthly with the exception of August and December. It's a great opportunity to meet people who have a passion for glass. We talk, learn and enjoy each others company. If this is something you might be interested in, please come and join us. We are over 55 members strong and growing every month. This month’s meeting is Thursday, April 26 at 6:30 P.M. We will be meeting at Capparelli's Restaurant at 2923 Thousand Oaks for our meeting and dinner. Afterwards our own Kay Lotz will demonstrate a photo resist technique for sandblasting that allows for a great deal of detail in the final piece. She will also explain her personal blasting set-up a topic of great interest to many of us. You can see examples of Kay’s work in the photo gallery at etchmaster.com or in person at Wired Designs Studio. We are only days away from San Antonio’s largest event, Fiesta San Antonio. Did I say event? I meant events, over one hundred activities, parties, and parades. This San Antonio tradition brings the city together to celebrate our history and culture. The focus of much of the activity is on the Battle of Flowers and Fiesta Flambeau Parades. I must have been thinking about those hot afternoons waiting for the parade to start when I made this piece because it reminds me of the cold sweet raspas you can buy from the street venders. You might know them as shaved ice but here in San Antonio it’s a raspa. The sweet syrup poured over ice in a paper cup so flimsy it’s only a matter of seconds before the sticky wet syrup drips down your arm. That’s what this reminds me of as the colors swirl just beneath a rough layer of glass. I can almost taste it. In order to support a local artist, you must first know who they are. Contemporary Glass in Texas is an online listing of artists living and working within the state. The site allows you to search alphabetically by artist, review artists by city and by category of work (i.e. 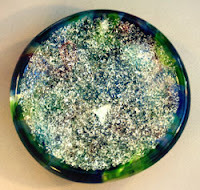 3-dimensional, flat, jewelry and glass on metal). It's a great neutral base of information available to anyone with an interest in Texas glass art/artists.